Impressive, easy-to-grow crops of great big delicious heads of fresh sweetcorn are a benefit for every gardener. One of the finest sights in gardening is a dense stand of corn gently waving in the breeze. 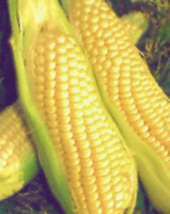 Fresh thick ripe ears of corn are one of the most flavoursome crops that can be grown. Within minutes of being harvested, the sugars in corn rapidly begin turning to starch. The result is that sweetcorn looses its flavour from the moment it leaves the earth. By growing your own corn you will be able to experience the wonderful flavour of truly fresh corn on the cob for yourself. Corn is a hardy crop and is easy to grow. In mid to late spring, Plant seeds individually in 2 inch pots using a mix of 2 parts potting compost to one part vermiculite. Plant each kernel 1 inch deep. They will not germinate until the temperature of the soil is at least 55 degrees farenheit so best to start them off in a greenhouse or coldframe. Water regularly and allow them to grow to a height of at least an inch before thinking about planting out. Space the kernels 9 to 12 inches apart in rows. Plant at least two rows side by side to ensure good pollination. A block of four rows is better because more corn plants will germinate. Allow 30 to 36 inches between rows. This is important. Sweetcorn should be planted in blocks so that they get the maximum change of pollenating each other. If they fail to pollenate you will not get any cobs. You can add nitrogen fertilizer once the plants are 18 inches tall. Aside from that, keep the soil weed free and in a few short months you will have a tall crop (5 foot and above) of corn. When harvesting, put the water on to boil and then go and pull off the ears you need to cook and get them into the boiling water as soon as possible. Sweetcorn really is a great crop and kids in particular get a kick out of growing something so tall.